How Deep Do I Plant Hollyhock Seeds? 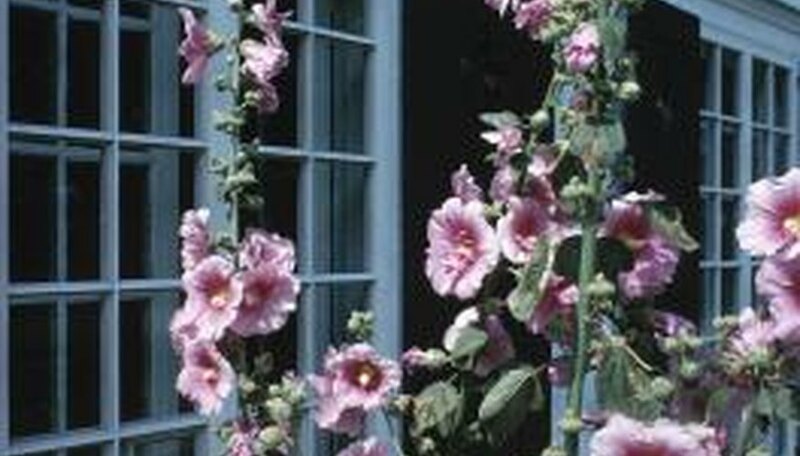 Hollyhocks, or Althea rosea, are delicate flowers that blossom flower in mid-summer season. The plant, which has about 60 species, are native to Asia and can be biennial or tender perennials. Flower spikes emerge from May to October and can be 5 to 9 feet tall. The flowers are usually shades of white, violet or pink. The plant grows best in full sun. 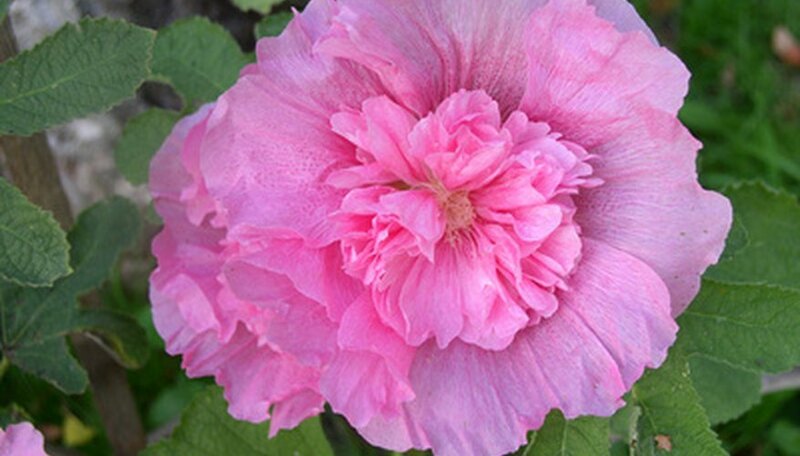 The word "hollyhock" comes from “alkaia,” the Greek word for mallow. "Holly" may be the word “holy” corrupted. A hollyhock is the Tokugawa family’s seal in Japan. It is a symbol to the era that the Tokugawa family ruled Japan. 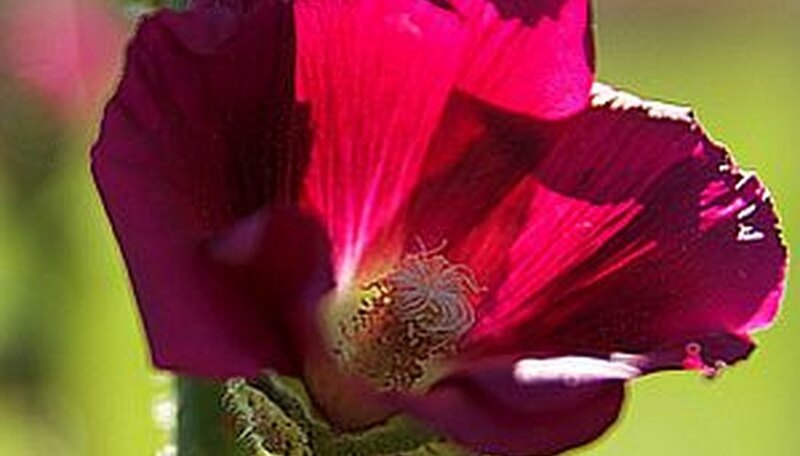 Thomas Jefferson once bred a variety of hollyhock that was dark red. It was cultivated at Monticello in his flowerbeds. Hollyhocks were found in the grave of a Neanderthal man from more than 50,000 years ago. Tudors used hollyhock dried roots for additions to their wine to stave off blood clots and miscarriages. The Chinese used it in many of their recipes. Hazel buds, wild thyme, marigolds, and hollyhocks were a recipe from 1660 AD that supposedly enabled anyone who ate it see fairies. Hollyhock dolls were made for children as well. A lotion can be made from flowers to heal sunburn and dry skin. Infusions from the flowers were used for bladder and lung disease. Place the whiskey barrel in its permanent location in a sunny spot. Once you fill the container with potting soil, it will be too heavy to move. Fill the planting container all the way to the top with potting soil. Hollyhocks grow a very long taproot and need as much root room as possible. Plant the miniature hollyhock seeds in the top of the container in the spring when the temperature is consistently above 70 degrees F. Scatter the seeds lightly over the top of the soil and cover with approximately 1/4 inch of potting soil. Keep the soil's surface evenly moist throughout the growing season, but do not saturate the soil. Cut back the stems to the bottom-most basal leaves after the first bloom to encourage the plant to bloom a second time. The basal leaves are the largest leaves that grow at the base of the plant. Another option is to allow the hollyhocks to grow undisturbed. This will result in the plant self-sowing itself plentifully for the next growing season. Watch for the miniature hollyhocks to grow again the following season in the same container. Depending upon the area surrounding the container, they may also sow themselves in the ground around the container. If this is undesired, dig these plants up and discard them, or relocate them elsewhere. Most old-fashioned hollyhocks, Alcea rosea, grow 6 to 10 feet tall and flower from June through August. The tallest hollyhock, as reported in the 2004 edition of "Guinness Book of World Records," was 19 feet, 7 inches, grown by George Palmer in 1978 in England. Dwarf varieties, such as Alcea rosea Majorette Mix, grow 2 to 3 feet tall. Plant seeds in full sun in early spring. Get flowers the first year by planting nursery plants or starting seeds indoors eight weeks before last frost. In U.S. Department of Agriculture climate zones 7 and above, plant seeds outdoors in August for bloom the following summer. Let hollyhocks ripen and drop their seed for new plants each year. Or cut the stalks after bloom to produce a second flowering from the same plant in fall. Rust, a fungus characterized by orange pustules on leaves and stems, is the most common disease for hollyhocks. Help prevent it by watering only at the soil level, not overhead. Spray the leaves (especially the undersides) and stems with a copper-based fungicide every 10 days before rust starts. Alcea nigra has single, dark-purple blooms and grows 3 to 6 feet tall. Alcea pallida grows 5 feet tall and is a Turkish species with small, single lavender blooms. Alcea rugosa, a Russian variety, grows 7 feet tall, with large, single, pale yellow blooms. It is rust resistant. The flowering hollyhock has large, lobed leaves that are subject to a fungal disease called hollyhock rust and to insect infestation. Hollyhock rust is prevalent almost everywhere hollyhocks are grown. Air currents and rain carry fungal spores to healthy plants in other locations. The fungus can also overwinter with plant debris, infecting new plants that emerge in the spring. Hollyhocks are hardy, drought-resistant plants. They thrive in full sun in locations that might be too dry or too hot for other plants. 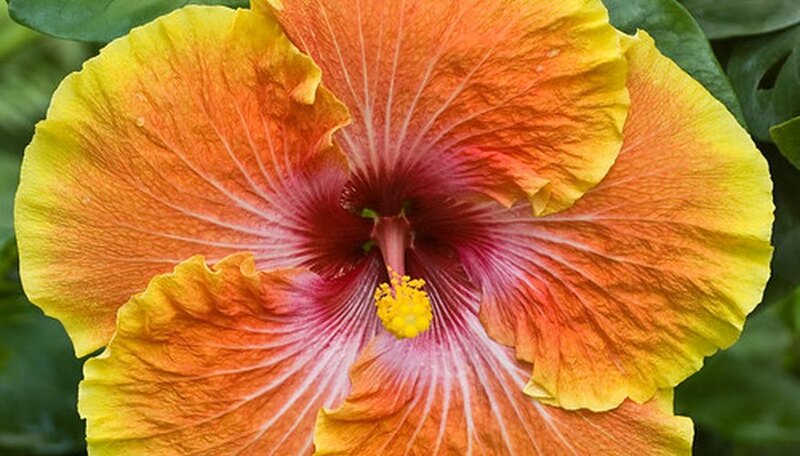 Excessive humidity or dampness encourages the spread of hollyhock rust among the plants. If hollyhock plants need watering, they should receive it in the early part of the day so the leaves can dry quickly and avoid conditions that would favor fungus. A thorough autumn cleanup will help break the disease cycle of hollyhock plants. Cut stems back to the ground, and destroy all leaves and plant parts. Do not put infected plant debris in the composting bin because it will contaminate the compost. Remove any dead or dying flowers throughout the growing season. To remove, simply pinch or clip the dead or dying growth where it branches out from the main stalk. Use your pruning shears to cut the hollyhock plant down after it turns brown during the fall months. According to University of Illinois Extension horticulturalists, stalks can be cut down to new basal foliage when flowering is complete to keep the plant looking neat. Since the plant has a dormant season where it is not visible in the garden, you can leave 1 to 2 inches of the stalk sticking up out of the ground. This will help you remember where the plant will sprout next year. Water the plant after pruning sessions. Pruning can sometimes steal away nutrients from the plant. Waters will help the plant stand up to the loss. Hollyhocks are drought-resistant plants. Excessively wet soils of winter can stunt growth and cause root rot. Planting the flowers in corners and near walls offers protection from wet conditions. Cut the stems of the hollyhock plants down to the root crowns once they have turned brown following a hard frost. Plants suffering from rust should be uprooted and destroyed as the fungus can infect new plants that emerge in the spring. Freezing temperatures can destroy the hollyhock. Prepare the winter bed by mulching with a thick layer of straw or cedar chips. This will insulate the soil and offer protection to the hibernating roots. Wintering hollyhocks can be protected from cold winds by covering them with a canvas tarp or thick sheet. Hollyhocks can be uprooted and brought indoors during winter months. Care must be taken not to damage the taproot when transferring to a pot. Wait until hollyhocks have stopped blooming in late July or early August. In hot temperatures the lower leaves wilt and drop off. However, new growth appears at the base of the plant and produces a second crop of flowers. The "Sunset Western Garden Book" suggests gardeners cut the hollyhocks down to the new growth to encourage reblooming, then apply a balanced fertilizer according to the manufacturer's directions. Cut the hollyhock stalks 3 inches above the ground in fall, after the second bloom cycle. Cover the root crown with 2 to 3 inches of mulch. Dispose of the cuttings in the trash. Rust produces dark yellow pustules on the underside of leaves, and hollyhock leaves are particularly disease-prone. Remove diseased leaves throughout the growing season. Cut stalks to the ground. Otherwise, leave them alone if you want them to reseed. If your hollyhocks have been infested with rust disease, it will be necessary to cut them down and remove and dispose of all the cuttings from your garden. Place four inches of mulch over the cut hollyhocks to prevent damage from frost. Move hollyhocks now if you plan on giving them a new home in your garden. Do this especially if they are overcrowded to reduce chances of rust disease infestation. Plant seeds indoors in 3-inch pots in February in a good seed-starter soil or mix. Keep pots moist but not over-watered until seeds germinate. Thin weakest seedlings out, leaving just one hardy seedling. Hollyhocks will take about 2 weeks to germinate. Allow soil to dry out between waterings as your seedling grows. Give your new plants plenty of direct sunlight (growing in a cold frame, greenhouse or greenhouse window is best.) Turn your plants and move as needed to keep the growing plant from stretching too far one way into the light. Transplant your hollyhocks into the garden by digging a hole twice as big as your pot and adding compost or fertilizer to the bottom before adding the flower. Hollyhocks need a strong root system to flourish, so be sure to remove your plant carefully from the pot and bury the whole root system in loose, well-draining soil. Do not expect much in the way of blooms in your plants first year. 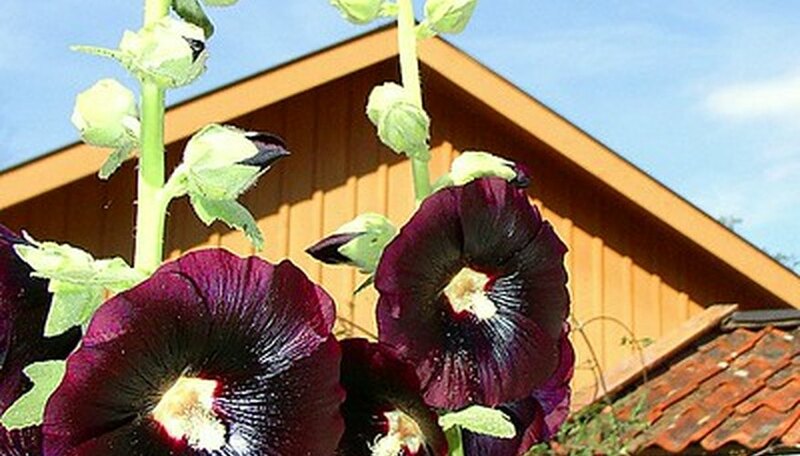 Once established for a year, your hollyhocks will bloom brightly year after year. Decide whether you would like to plant your seeds in fall or spring. If you plant in spring, aim for six weeks before the average frost-free date for starting indoors or one week before for starting indoors. Select a full- to part-shade location in which to grow your hollyhocks. Remember that hollyhocks have tall spires, so choose a spot toward the back of the garden bed. Amend soil by adding compost, aged manure or an all-purpose fertilizer. Try to choose a location that remains evenly moist or plan to provide irrigation. Plant seeds on the surface of the soil or just underneath. It looks odd, but it works. If planting indoors, provide lighting from the beginning rather than waiting until the seeds germinate. Water your hollyhock seeds regularly. Try to keep the soil consistently moist while the seeds are germinating. Pull the seed pods from each hollyhock stalk and place them in a plastic bag. The pods should be dry and brown. Collect up to 3/4 of the pods from each stalk, but leave some on so the plant can reseed itself. Open the pods completely over a paper plate and work the seeds out of the pods. Remove any non-seed material and discard so all you have on the plate are the seeds. If they do not appear thoroughly dry, set the plate in a warm, dry area of your home for a few days. Store your collected seeds in a well-labeled envelope that includes the type of seeds, the color of the blooms, and the year you collected them. Place the envelope in a cool, dry location for up to five years. Both spring and fall are good times to plant your hollyhock seeds. Hollyhocks usually take 1 year to start blooming. Plant hollyhock seeds in a sunny location to a depth of 1/8 inch. Cover lightly with loose soil and firm down with your hands to remove air pockets.